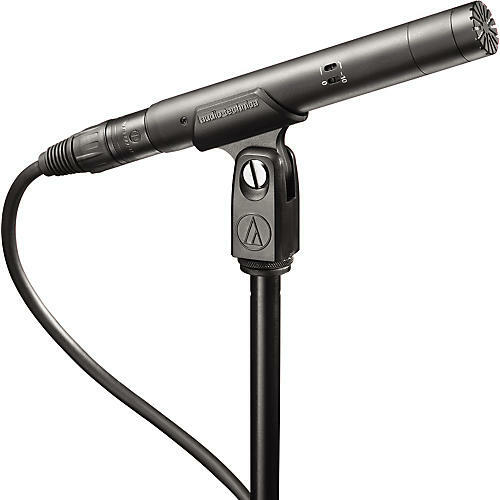 The low-profile Audio-Technica AT4022 is an omnidirectional condenser recording mic that is outstanding for piano, acoustic guitar, and other acoustic instruments. With a flat, extended frequency response and wide dynamic range ideal for critical studio and live applications, the AT4022 microphone handles high SPLs with ease. The AT microphone's omnidirectional polar pattern preserves the "sound" of the recording location, delivering flat response and freedom from proximity effect. The Audio-Technica AT4022 mic's low-mass diaphragm improves transient response and reduces handling and mechanical noise transfer. Requires 48V DC phantom power.